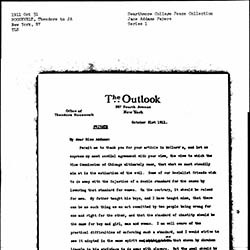 Creator is exactly "Roosevelt, Theodore"
Produced to appeal to woman voters, this Progressive Party pamphlet includes Jane Addams' nomination speech, a letter from Theodore Roosevelt to Addams, the party plank on equal suffrage, and the party's plans for democratic rule and social and industrial justice. 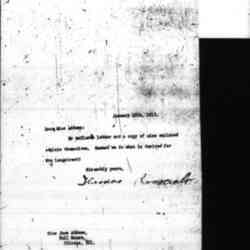 Roosevelt verifies that he and the Progressive Party supports woman suffrage and asks her to make that stance known. 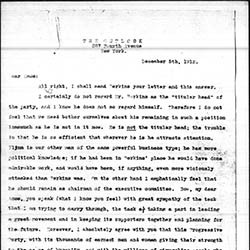 Roosevelt's secretary forwards a letter from Thomas Robins to Addams for her consideration. 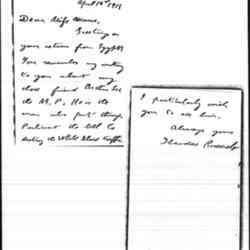 Roosevelt writes Addams thanking her for her assistance in an investigation. 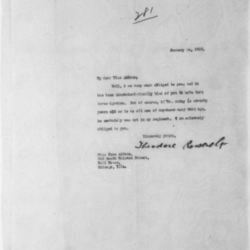 Roosevelt asks Addams to read a letter and handle the potential issue of a man from his military regiment in need of money. 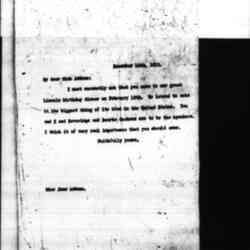 Roosevelt invites Addams to be a speaker at the Progressive Party's Lincoln Birthday dinner. 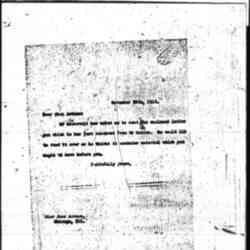 Roosevelt praises Addams's work for the Progressive Party campaign, noting that they fought a good fight, yet went down in disaster. 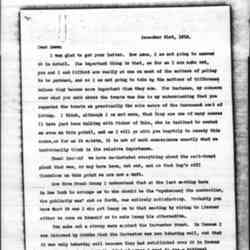 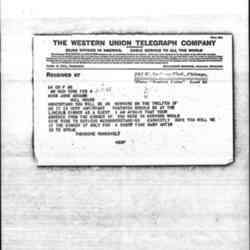 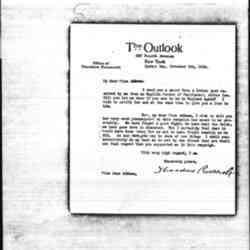 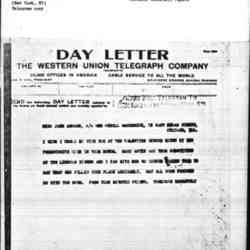 A letter of introduction from Roosevelt to Addams concerning Arthur Hamilton Lee. 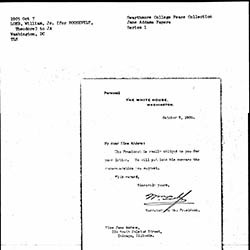 Roosevelt asks Addams to meet with George Sylvester Viereck, a poet and a Progressive. 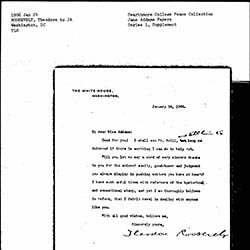 Roosevelt sends regrets that he is unable to attend a Progressive Club dinner in held in Addams' honor. 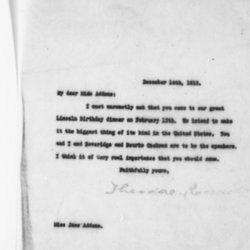 Roosevelt urgently requests Addams to attend the upcoming Lincoln dinner in New York City. 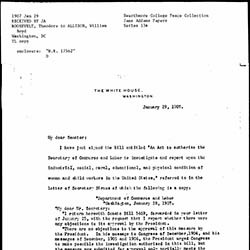 Roosevelt encloses letters (not found) about the appointment of Helen Longstreet to the Progressive National Committee. 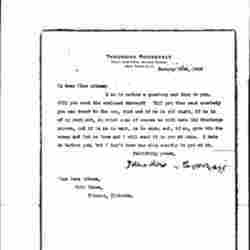 Roosevelt discusses the Progressive Party and trusts with Pinchot. 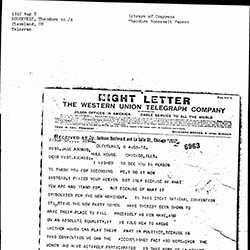 Roosevelt discusses George Perkins' role in the Progressive Party and his views on trusts in the Progressive Party platform. 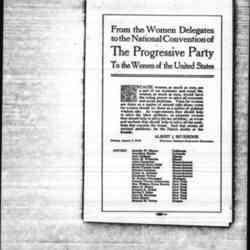 Roosevelt thanks Addams for her supportive speech and for seconding of his nomination for President at the Progressive Party Convention. 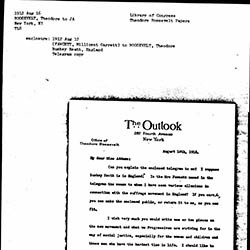 Roosevelt asks Addams to consider making public the enclosed letter of endorsement from Millicent Fawcett and to write an article or two about the social platform of the Progressive Party. 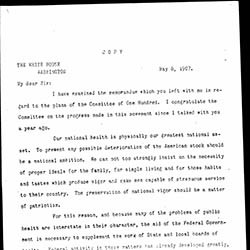 Roosevelt writes Fisher about progress made for the involvement of the federal government in public health. 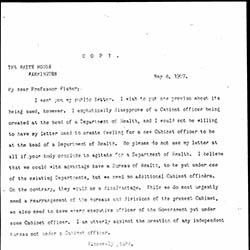 Roosevelt writes Fisher about his opposition to creating a new cabinet position for a department of health, arguing instead for placing it under the guise of an existing cabinet position. 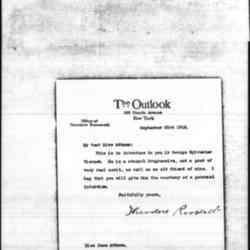 Roosevelt informs Allison of the passage of a law to investigate and report on the conditions of working women and children in America. 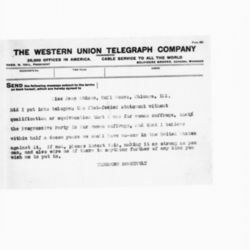 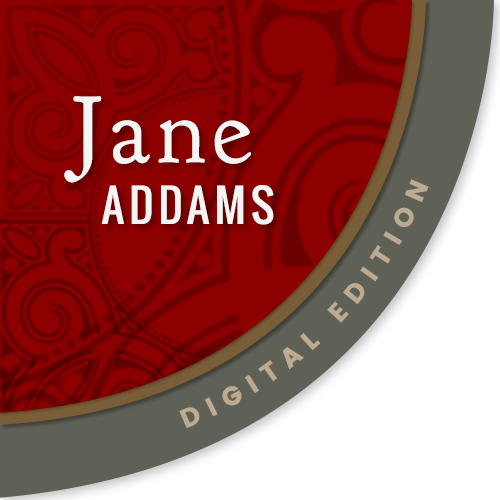 Roosevelt praises Addams' demeanor and wishes her well with her task. 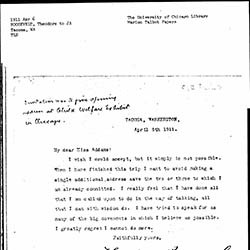 Loebs informs Addams that President Roosevelt was obliged for her letter and plans to put her recommendation in his message.